Hobbits & Hairdye: My tips for coloured hair // dyeing & maintaining. My tips for coloured hair // dyeing & maintaining. I think it's safe to say that when it comes to dyeing my hair, I've been round the block a few times. I've been pretty much every hair colour under the sun and I think that makes me a bit of a hair dye connoisseur. As I'm very much a DIY kind of gal, I've had a lot of practice and developed a few tips and tricks over the years. So I thought I would share a few tips to help you if you are looking to dye your hair some jazzy colours or just looking to maintain colour you already have. One of my biggest tips for dyeing your hair, especially when dying your hair artificial colours is to always put the dye on dry hair. Most packaging will tell you to use it on damp/towel dried hair, but I find putting it on dry hair allows for a more even coverage and helps the colour to fully saturate into your hair. Conditioner is your friend. Mixing your dye with conditioner not only means you can get more use out of your dye, it also enables you to mix your own colours to get the exact look you are going for. Also, even though most non-natural hair dyes are just vegetable dyes and aren't actually that damaging, adding conditioner to your dye means that your hair will be in the best possible condition from the get go and will hold you in good stead for when it comes to maintaining the colour. Ensure the hair is fully coated and has been properly saturated. I always make sure to divide my hair and dye it bit by bit and properly work the dye into my hair using my hands. By rubbing it all in and separating the strands it will prevent a patchy dye job which nobody wants (trust me, I've been there) but will also make the colour last longer because it is properly in the hair follicles. Do a bit of research into brands to use, some are much better for keeping colour than others. My go to brands are Bleach London (not the best for keeping colour, but I love the shades,) Schwarzkopf and colour freedom. I've also heard amazing things about Arctic Fox and think I'll be trying them next time. All these brands produce really lovely colours, are really good for mixing and building up colour and are also for the most part quite long lasting. When it comes to rinsing the colour out, make sure you use cold water, it's not the most comfortable experience but will ensure the colour locks into the hair helping it to last a lot longer. Warm or hot water will pretty much just rinse the majority of the colour out straight away. This is going to sound super grubby but the best way to stop your colour fading is to wash it as little as possible. I went from washing my hair 2-3 times a week to 1-2 and have noticed a vast improvement in how often I need to top up the colour. If you can just reduce the amount of times you wash your hair it will be a massive help in maintaning your colour. When it comes to not washing your hair as much, dry shampoo will become your best friend. It is perfect for helping to keep your hair looking fresh during those in between days. Some brands now offer coloured dry shampoos which are also perfect for hiding those pesky roots for a little bit longer too. If you can find shampoos and conditioners that are specifically designed to maintain colour, this will also help prevent colour leakage when washing your hair as it will help to keep it locked in a bit more. 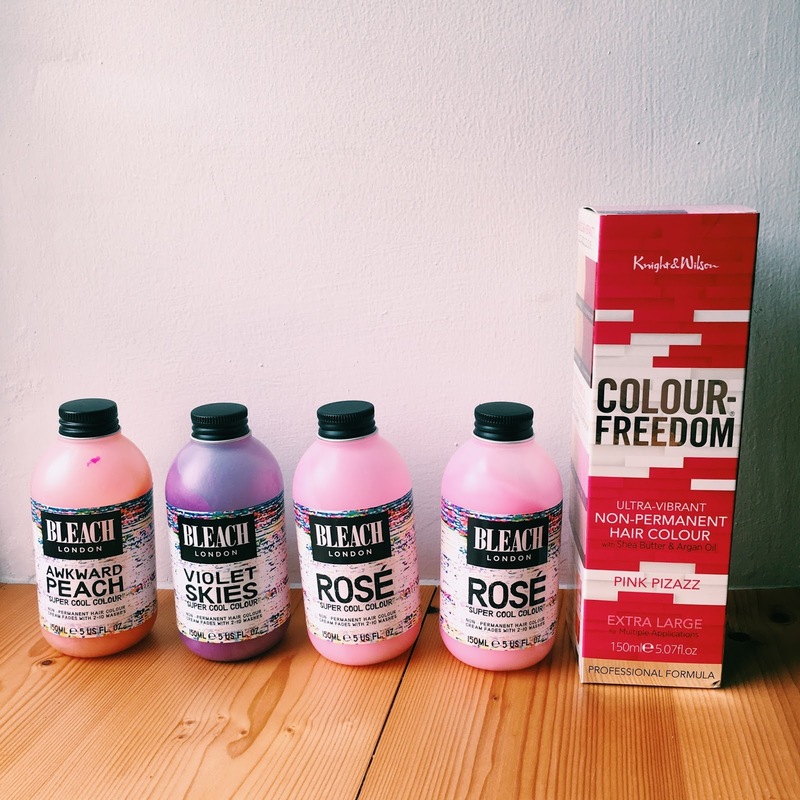 I recently started using the Bleach London pink shampoo and conditioners which actually contain colour, so help top up your dye with each wash. They aren't dyes so aren't a massive help, but they do enough to keep it looking slightly brighter. These were just a few of the things I do to keep my hair looking as fresh as possible. Obviously these are all affected by the individual hair quality and colour. Some colours do just stay in your hair better whereas others are just a bit more of a ball ache to maintain. Pink is one of these colours, and is definitely more of a commitment than other hair colours I have been, so that is also something to bear in mind when picking a colour to go. Do you have any tips for maintaining colour? i always wanted purple hair (& did have at one point) but went off it & now im in love with the grey-silver look but im too scared😩 you really suit your pink hair too! Very informative blog post! You look amazing with that hair color!